The dish above was my late lunch on Tuesday. 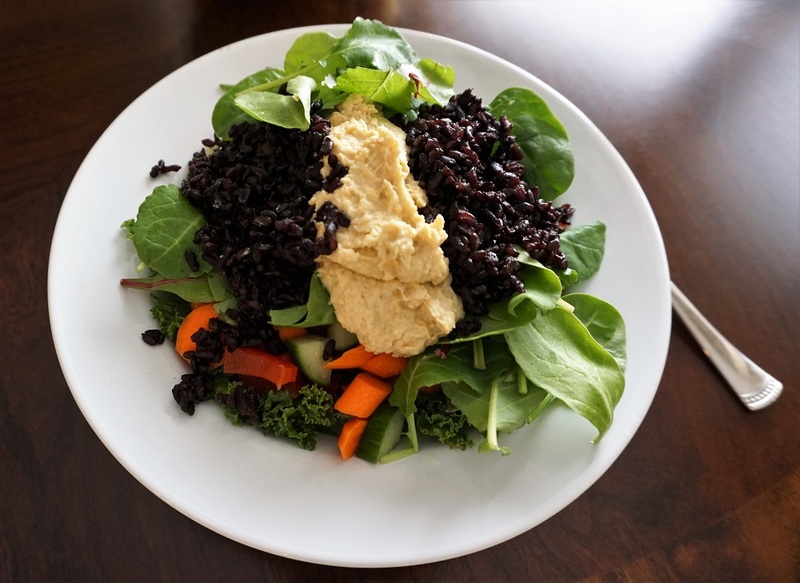 It includes a variety of fresh sliced vegetables, several types of organic leafy greens, black rice and hummus. I often feature food on my blog, but it is rarely a dish I prepared. Today, I am taking you on a tour of my kitchen, specifically the prepping of the elements of my meals for the next few days. Just making a salad can mess up the whole kitchen and take longer to clean up than it did to eat, but I’ve found a way to save lots of time every week. When I bring home groceries, I clean and prepare most of those items at the same time. For example, while I was making my breakfast this morning, I cooked some black rice and soft-boiled eggs for lunches over the next few days. Later in the morning, I made my bi-weekly trip to the market to buy fresh fruits and vegetables. As soon as I returned, I made fresh hummus, baked mini purple sweet potatoes, peeled, and sliced carrots then cleaned the kitchen from top to bottom. I won’t have to put so much effort into that room again for at least three days, but I will have healthy options ready to combine in a variety of ways at any time. I am not a fan of sandwiches, but I can add the hummus, greens, and chopped vegetables to pitas or make wraps in a snap. I much prefer to have salads, soups or stews made with a variety of vegetables, beans, and grains. Nuts, seeds, and garlic cloves are kept in my refrigerator to keep them fresh longer. Many of those items are now in the new containers on the right side of the middle shelf. I am on a mission to remove all plastic from my kitchen. I have ordered lots of Glasslock containers. I bought a few at Bed Bath & Beyond last week, but they didn’t have the sizes I need. I found a reasonable price on the larger sizes here. 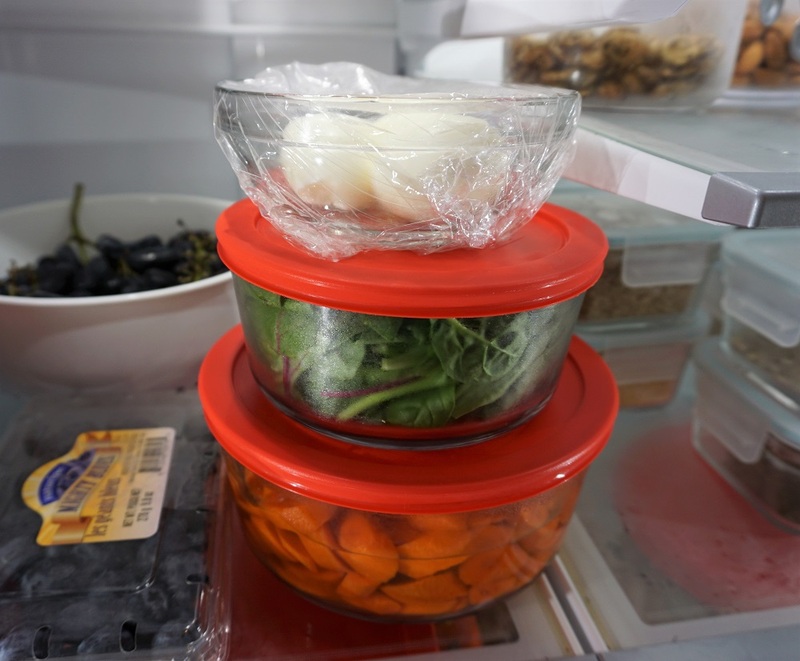 These airtight glass storage containers are BPA free, oven safe, non-toxic, refrigerator/freezer safe, microwave safe, and dishwasher safe. They can be stacked inside each other for storage without taking up much space. I use almond milk to make my loaded oatmeal breakfast (recipe here) and vegetable stock to cook savory vegetables and grains. A favorite fall and winter food is purple Japanese sweet potatoes. I bake them and then store them in the fridge. These mini ones will be sliced and added to salads or as side dishes with a piece of chicken breast. I didn’t buy chicken this week, but if I had, I would have prepared and sliced it to eat later at lunch with black rice and mixed vegetables. I have a piece of organic chicken or wild caught fish a couple of times a month. I do not eat any other meat. I take a B12 vitamin and a D+ supplement at the urging of my Doctor. At my last exam, she hugged me and told me I am her inspiration. She has been my physician for more than twelve years, so she knows the details of the vast improvement in my health from changing my choice of foods. 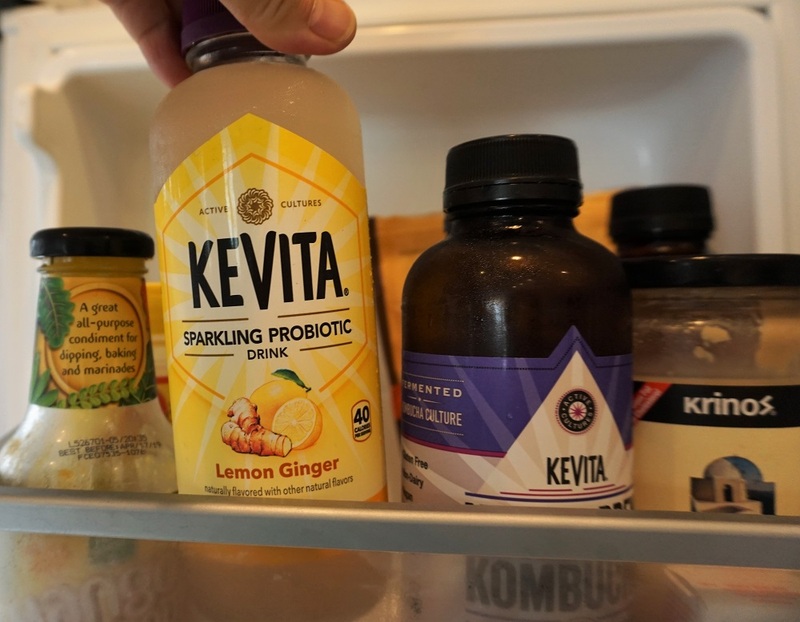 To make lunch feel special, I pour some KeVita Master Brew Kombucha in a wine glass to sip with my meal. It is fermented with a kombucha tea culture and contains billions of live probiotics, organic acids, and natural caffeine. Good health starts with a healthy gut (read more about your microbiome here). I have beans and or lentils every day. They are a top source of vegetarian protein and are great additions to soups, salads, and stews. Eating a combination of beans, greens, grains, and fresh organic vegetables for a late lunch keeps me satisfied until breakfast the next day. Oatmeal, groats, lentils and a variety of grains are always in my pantry. 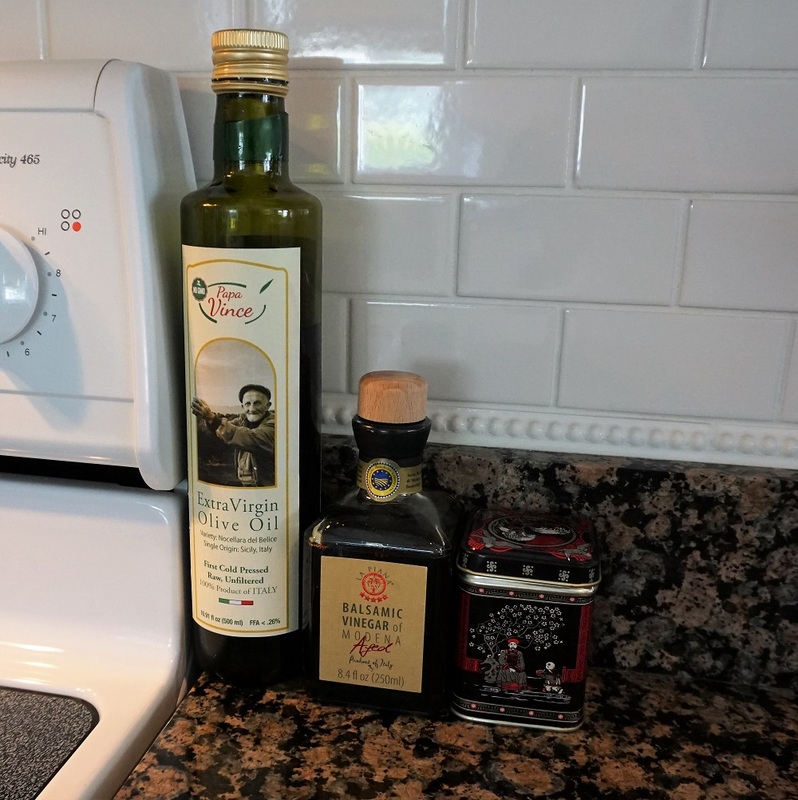 I don’t cook with olive oil, but I sometimes add it to my salads, use it to make hummus, and I always add aged balsamic vinegar to salads and vegetables. I keep toothpicks in that little Asian inspired tin. I enjoy two cups of coffee every morning while I read your emails or work on the blog post for the day. I drink gallons of filtered water every week and use it for my coffee, herbal tea, and anything else that calls for water. 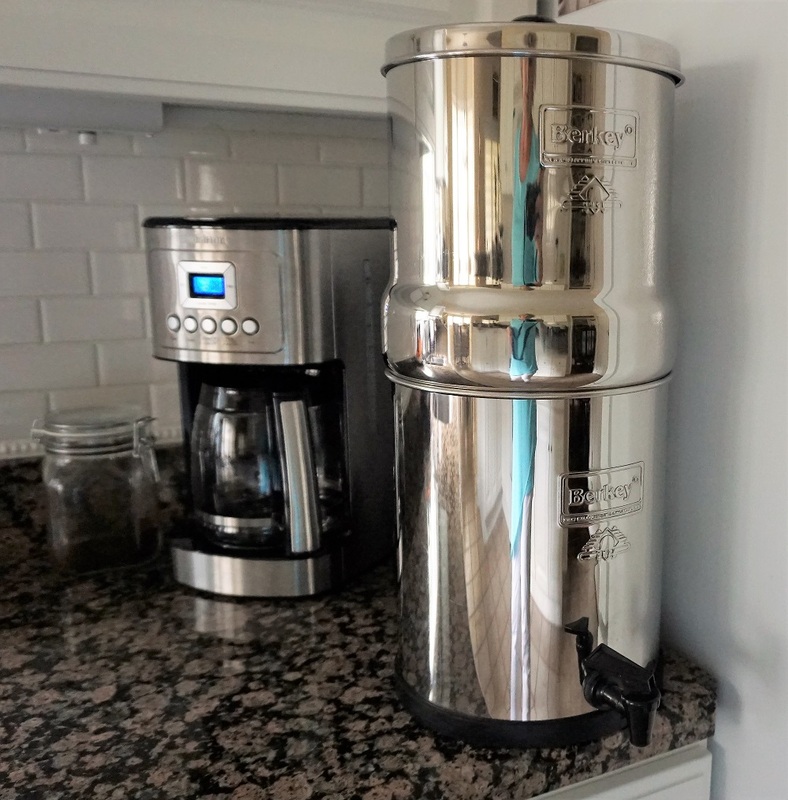 That’s my Big Berkey Water Filter System next to the coffee maker. I bought it last year here. I always have fresh seasonal fruit on hand. Bananas and apples are currently on display and ready to be enjoyed. 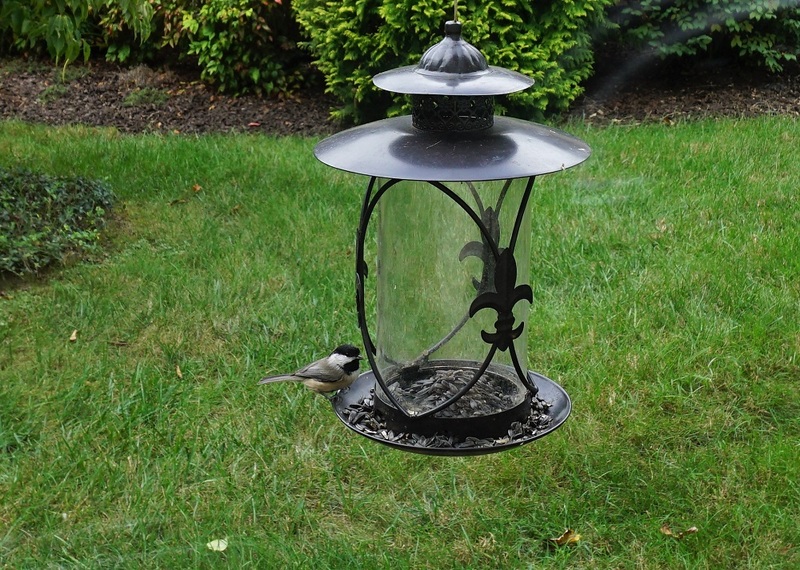 Every kitchen sink should provide a view of a bird feeder. I hope you enjoyed this little tour of my kitchen. Your questions and comments help me plan future posts to share with you. I attempt to go to bed between 9:00 and 10:00. I am almost always awake by 4:00 each morning. I have breakfast about two hours later, and then a late lunch at about 2:00 PM. Most of the time, I don’t eat again until the next morning. I never skip breakfast but skipping lunch wouldn’t bother me too much. The key is to have nutritious foods that give your body something to use for fuel. Fast food and processed foods just won’t cut it. Julie, I read your post that you are trying intermittent fasting. I have been doing it since February with the Faster Way to Fat Loss program. It’s very effective for me. Didn’t know if you were familiar with that program. Thanks Susan for all your great advice and tips. Makes me think about what is possible with healthier eating! Enjoyed touring your kitchen and fridge. You inspire me, as I am struggling at almost 70 to lose those pounds I lost in 2010 and gradually regained. Right now I am recovering from strained back muscles, but want to shape up and feel better. Thanks for the boost. I really enjoyed your kitchen tour! Hi Susan, I enjoyed your kitchen tour very much. Your doctor is right; you are an inspiration. I have been doing the same for the past several months — eating a plant-based diet and organizing my pantry and refrigerator as a result. It is amazing how your life can be simplified by eliminating processed foods and adopting good planning methods. Thank you for the suggestion to cook the sweet potatoes in advance. In just the first week of plant-based eating, I had more energy and slept better. My occasional irregular heartbeat and GI pain have disappeared and, for once, I am looking forward to the results of my blood tests. My husband’s doctor high-fived him when she read his cholesterol results — down to 148 total cholesterol! The lowest reading in about 25 years. He is only a few points away from no longer being considered pre-diabetic. Thank you again for spreading such positivity! I smiled the whole time I was reading your comment. Good for you and your husband! I really enjoy reading your posts. I am 54 and trying to change my eating habits. I have many stomach issues especially since having my appendix out in 2014 and when I eat better I feel much better. I also have lots of joint pain, feet, knees, hips etc. and have discovered if I stay away from sugar it is much better. Keep posting your great information. I really enjoyed the tour of your kitchen and am going to steal shamelessly from you. Have a great day! My aching joints and delicate digestive system were begging me to stop eating processed foods full of sugar, fat, and salt. I’m so glad I listened! Steal away, my friend. I hope it helps you to live with less pain also. Thank you for detailing your meals. It always is inspirational to learn how to improve my health. I have enjoyed your porridge nearly every day for several years. It is filling and I feel that it is incredibly nutritious. A great way to begin the day. It took me a few servings to get used to no sugar. The cinnamon does give it a nice flavor and I no longer miss the sugar one usually puts on cereal. Thanks for the tour.. so enjoyable and informative. Good Morning Susan. Would you please tell me how many meals your recipe for oatmeal would normally make. I really like the sound of it! I am reading Eat to Live at your suggestion and I am interested it trying this life style. I am basically healthy but I would like to lose a few pounds and stay healthy for many years. I am 66 and plan on living a long time and would like to stay healthy! Thank you for all the inspiration and fashion tips you are a very lovely lady. Hi Beth. The pot of oatmeal will last for about five meals. I warm it up in a saucepan with more almond milk and stir in another handful of fresh rolled oats to give it a heartier texture. My bowl is about the size of my outstretched hand. Several summers ago, we had a kitchen moth invasion which we eventually traced to a package of pine nuts we’d bought. Since then, we store all seeds and nuts in the fridge, just to be on the safe side. Fortunately no problems with moths since then. Dear Susan, I notice that you take B12 and Vit D, as advised by your doctor. I am intrigued as I take these supplements due to an under active thyroid ( along with medication). If it’s not too personal a question, would that be why you take these supplements and adopted a new diet? I always feel ill but I’m told my thyroid is normal with my dosage. I have now read that I would benefit from changing my diet to gluten free which I’m looking into. It seems a long heavy road, but I am researching . I’m in the UK so some of the items you buy I would not be able to get, but I was curious because you have so much energy. My thyroid is trouble-free, but since I don’t eat meat B12 supplements are a good idea. (That’s the only way to get B12.) Many people here are vitamin D deficient. I have been for years, but that’s the only mark against me on my blood tests. My digestive system works so much better now that I have eliminated gluten from my diet. It takes some effort, but it is definitely worth it! Thank you for such an inspiring post this morning. I plan to do grocery shopping so will certainly use some of this new information. Also, you are so right about the processed food in making a difference in our bodies! Have a good day. have handy. Now to make me sound really lazy, it is a lot of work eating right!! Quick question. When you started turning gray, how did you deal with the change? 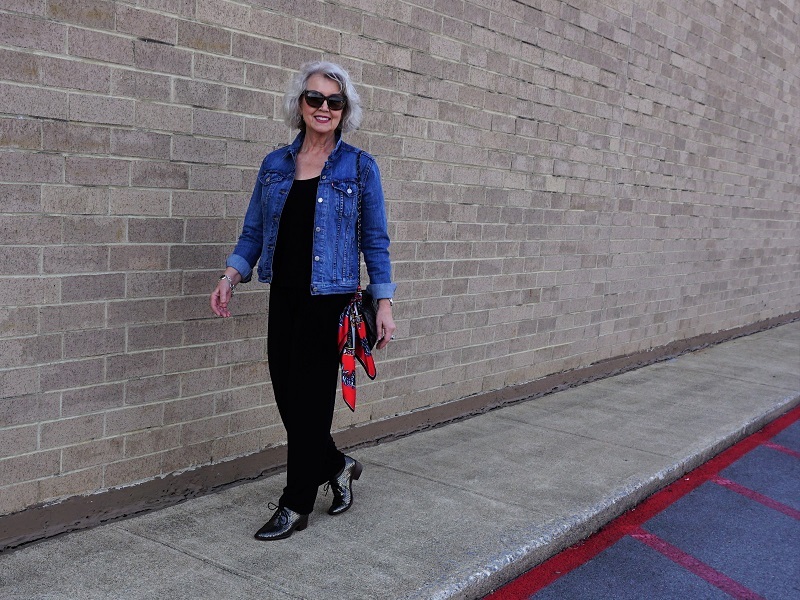 After coloring my hair since I was nineteen, I was more than ready to stop by the time I turned fifty. I kept my hair short during the growing out phase and used a temporary color a couple of times during the process. I also wore a hat frequently. I’ve never been happier. Fantastic post. I love your attitude about food. It’s so important to know what we are putting in our bodies. You are an inspiration! 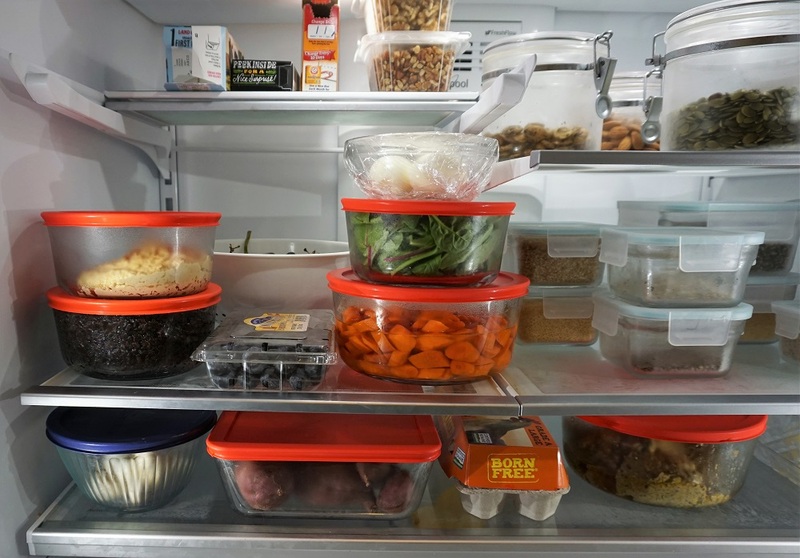 I use the same glass storage containers in my kitchen after getting rid of all my plastic ware. Costly, but well worth it. It’s healthier and I find my food lasts longer as well. I’m interested in your recipe for homemade hummus. Would you share with us, please? Two cans of chickpeas, (drain and reserve the liquid) two cloves of garlic, the juice of two lemons, 1/2 cup of tahini (sesame seed butter), a couple of pinches of Kosher salt, 1/4 cup of Olive Oil, (paprika, more olive oil, and parsley to garnish). Blend in a food processor, blender or Vitamix. I could keep the hummus in the fridge for a week in an airtight container, but it never lasts that long. It is my favorite alternative to salad dressing. Thank you for sharing. As always, you are honest and informative and I look forward to your tips and inspiration. Your blog is always an inspiration to those of us struggling every day. (Of course, we don’t have the wonderful Mr. Mickey as an adventure partner and must make do.) I am printing this post out and keeping it for future reference. I am on a modified FODMAP plan, and do better if I avoid beans, legumes etc. Perhaps as I lose weight and get healthier that will change. Did they ever bother you? Do you prefer one kind over another? Thanks again for all you do for all of us…you are my hero! It did take a few weeks to get used to more wholesome foods. I added the beans a little at a time so that my body could adjust. Thank you for this post. Very informative!!! (And thx for hummus recipe above, too). Enjoyed this tour of your kitchen very much. I am trying to eat healthier and you have such good suggestions. Susan, I also wanted to ask… do you go for your morning walk as soon as you get up? Thanks for all of your information. I love getting this kind of information and it shows you’re a real person like your readers!!!! I’ve been told that I have heavy metal toxicity and I need to get a water purifier. I’ve been looking at the Big Berkey. I noticed you didn’t have it on a stand. Is it stable as is? Question about it: People have said that you have to put water through it everyday or it causes some sort of problem. I’m concerned as I go away on vacations for 7-10 days. Have you had any issues? I like having it near the fridge on the counter because it is where I need to use it and it is stable. I have both the black carbon filters and the white heavy metal/fluoride filters. When I go away, I empty it, wash it and put the filtered section in the fridge until I return and refill it for continued use. You will need to buy new filters each year. About twice a week, I take it apart and wash each part before refilling it for the next round. I have been looking at the Travel Berkey and the Big Berkey. It’s funny that I had been reading about them and then read your post and you had one! According to the measurements, neither of these will fit underneath my kitchen cabinets. Do you find this to be a problem? It isn’t a problem because I have plenty of counter space. You will need to get to the top often, and it is heavy when you fill it, so I don’t move it. Susan, I entertained a friend from years ago today at lunch. I did the unthinkable and prepared a dish I’d never made. The ingredients were perfect: red quinoa, green lentils, and a small red onion cooked in vegetable broth. Chopped green onions, fresh flat-leaf parsley, and cilantro, chopped fine, slivered almonds, dried cranberries and a spoon of maple syrup. We ate it warm, spooned on bib lettuce with seeded crackers. Then we sinned with a small wedge of fresh apple one layer cake with rum sauce! The rainy day was perfect for old friends to enjoy good food! Sounds wonderful! Glad you made the most of this rainy day. When I read you were sharing a tour of your kitchen I was surprised. I’ve loved your posts for several years but didn’t remember you sharing your home. When I started reading and realized you were sharing what you eat and how you are organized to save time. Great GREAT post! I’ve been trying to change the way I eat to improve my health and you are my incentive. And you also gave me ideas for cooking for one! Thank you, a faithful fan. Susan,. Thank you for all your very helpful info. I’d love to try your breakfast oats, however I am currently watching my carb intake. None the less I may have to give it a try anyway as it sounds delicious. I’ve used the glasslock containers for years and love them. But the lids will eventually break. So now I’m scouring estate sales for vintage refrigerator boxes with glass lids. Fun and last forever. A while back I had my hormones evaluated, and it turned out that my estrogen levels were off the chart! 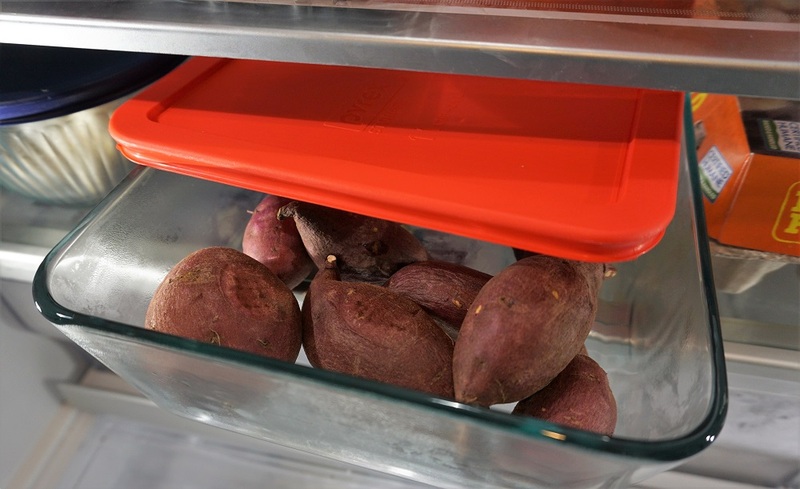 One of the things I was told to do was get rid of all of my plastic food storage containers, as they add something called “esoestrogens” to the food. Who knew??! I got rid of all of my Tupperware, but realized that my Corningware would be a good substitute. Since then I have attended estate sales to pick up additional pieces of Corningware to add to my collection. I have the glass lids, which are replaceable through Corning Outlet stores (and online). I normally use the glass lids if I am heating something up. I also have the rubbery lids, which I usually use for storage. You’re right about the lids, Linda. I wish they were sold separately as replacements. I no longer put mine in the dishwasher, nor do I try to open them straight out of the freezer or when they are very cold, and that seems to help. I now only buy the kind that lock on all 4 sides as these also seem to last longer. I still have a few plastic pieces, but only because I like the size and screw on lids. I enjoy all of your posts/videos. You are an inspiration! Thanks! Thank you Susan for more help with how you manage to eat healthy. I’m trying to get there. Did it take you awhile to get into how and what to eat? When I learned what processed foods include and what they do to the body, I was determined to change. It takes about three weeks to break a habit. Giving up the salt, sugar, and fat gave me a headache for a few days, but after I overcame the powerful addition, I knew I was in control of my body from then on. Thank you for sharing your healthy eating plans. I always enjoy your blog. Do you entertain at home from time to time? How do you prepare meals when you have guests? I rarely entertain. When I do, I prepare something simple such as baked chicken with a starch and a vegetable. I always serve a fruit-based dessert. Thank you for the tour of your kitchen. You are so well organized and nutritionally sound. You are an inspiration to me too! Thank you for sharing your kitchen post with us. 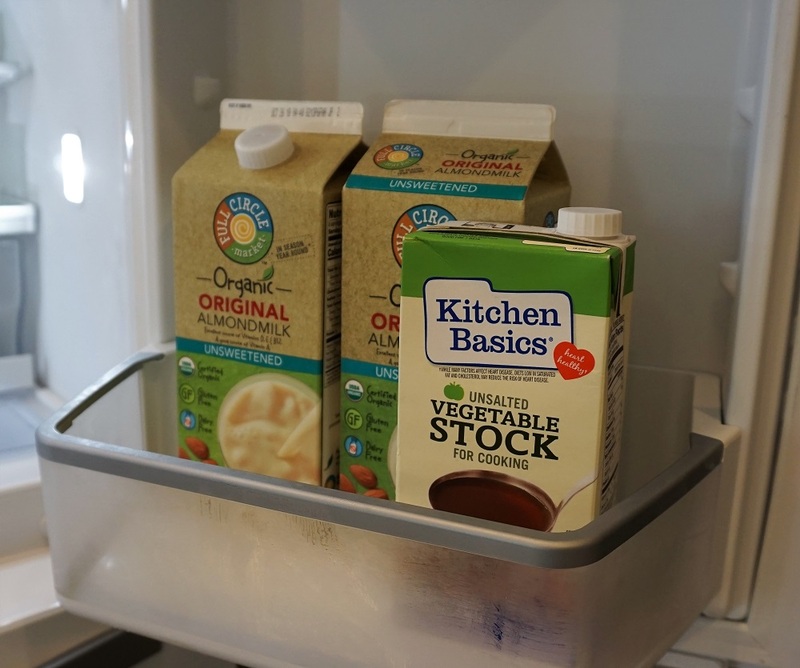 It’s always interesting to see what others who are eating healthy have in their fridge and pantry. You were my inspiration to start on this journey with your wonderful porridge recipe (which is taped to the cupboard door) and photos of the meals you enjoy while eating out. My husband agreed to try eating Whole Foods plant based…and we have been eating this way nearly 3 months. He has lost approximately 25 lbs and I have lost 16. His blood pressure is now in the normal range and hopefully he will be off his meds soon. I don’t have a blood pressure problem. We both have so much more energy and our arthritis has all but disappeared. Thank you for sharing your story and leading us to a much healthier way of life. Thank you for sharing your story. I’m so happy for you! I noticed your glass containers still have plastic lids, and you use plastic wrap to cover some glass dishes-??? Also, the probiotic drink you showed is just that—a drink. It is not organic, RAW, and live as is GT’s kombucha. The only true good stuff says RAW on the label. I mentioned that I am on a mission to rid plastic from my kitchen. It will take a while to complete this project. A new shipment of Glasslock containers arrived last night, so more plastic is on the way out the door today. The lids of those Glasslock containers are not plastic. I am still learning about probiotic foods and drinks. Thank you for sharing. Hi Susan, I enjoyed your kitchen tour post today. We, too, are a plant based household. Thought i would never convince my husband but he is enjoying the benefits of this diet. May I ask, do you use Nutritional Yeast for B12 on your beans? I recently purchased a B12 supplement but am not sure how often to take the supplement. Would you please provide the info on your B12 supplement and how often you take it? I do use Nutritional Yeast in my oatmeal and also in beans. I take a B12 supplement most mornings with breakfast. You said that you have a late lunch that satisfys you til breakfast. Does that mean you only eat two meals per day? No dinner? Yes. That is correct. Two meals per day are almost always enough food for me. Thank you! You have inspired me over so many topics, but this really is what I needed encouragement on…eating healthier and how to do it ..simply. I love the prep ahead…I’m going to try this! Instead of fast food…or unhealthy options I tend to grab becoz they are easy. I look forward to each topic. Your graciousness and willingness to share have inspired me to rethink and rework how I approach so many topics as I am aging (age 57). I truly believe these are really wonderful years and I’m certainly wanting to be my healthiest best I can! Learning and growing are marvelous gifts. All you do is appreciated!!! Thank you very much, Pamela. I’m not normally up this early but Hurricane Michaels winds and a power loss awakened me. With the power back, a cup of coffee in hand, I enjoyed your kitchen tour. I’d love it if you would share your homemade hummus recipe with your readers. Thanks for sharing. Two cans of chickpeas, (Drain and reserve the liquid. Add it back as needed to get the consistency you like.) two cloves of garlic, the juice of two lemons, 1/2 cup of tahini (sesame seed butter), a couple of pinches of Kosher salt, 1/4 cup of Olive Oil, (paprika, more olive oil, and parsley to garnish). Blend in a food processor, blender or Vitamix. I could keep the hummus in the fridge for a week in an airtight container, but it never lasts that long. It is my favorite alternative to salad dressing. I’m glad you are safe! Susan, thank you for sharing your healthy eating plan. When you are traveling, what do you eat for breakfast? When I travel, I order a vegetarian omelet, or oatmeal, or Greek yogurt with muesli/granola or fruit. (I travel with fruit and raw almonds.) I have been known to eat a salad for breakfast. I always try to eat plant-based, or the least processed and simply prepared items available wherever I am. Bread, jams and jellies, condiments, sauces, gravy, and cheese are things I always avoid. As much as I enjoy your blog on your beautiful clothes I really enjoyed today’s blog. The tour of your kitchen inspired me. We are what we eat and your blog today again told me what I knew and don’t always practice. I am new to your blog and love it and you. Thank you. Thank you so much for this post! I have taken inspiration from you in the last year in changing my eating habits and exercise lifestyle. I have done some similar things, so it is good to know I am on the right track! Thank you, Susan, for being such an inspiration and source of great information for those of us who are wanting to continue to live a vibrant and healthy life for as long as we can! We are all so conditioned to eating “traditional American” food, but it is not healthy for us in so many ways. My primary care doctor was intrigued by the correlation between good health and what we eat – so much so that he left his practice and went into research on the topic at John Hopkins. I am putting more thought into what I eat, and I am trying to eliminate all processed foods from my diet. This is a challenge, because it takes less time to prepare processed food than it does to prepare fresh food, and time is at a premium in my life right now. But I am determined to stay with it! You are so right Linda. Most of us are part of the TV generation. We have eaten the most advertised processed (pretend) foods for much of our lives. They have not served us well. 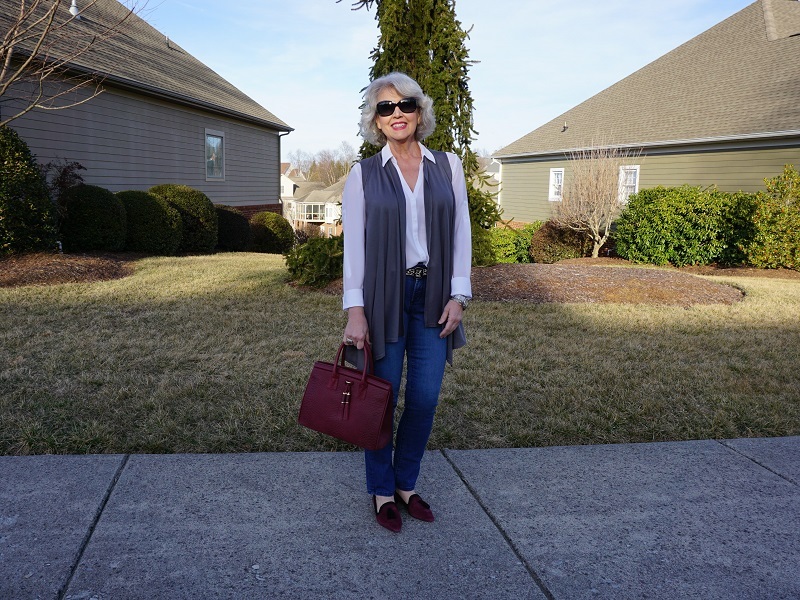 I love how this blog post garnered so many comments! I think this represents for many of us, an ongoing desire towards better health. Fantastic¡¡¡¡ you are an inspiration for me. I dónt like hummus but I´m going to prepare and eat with my chicken at lunch. I live in Ecuador and not always can find beans or lentils organic No Salt Added. Can you be kind and let us have a recipe from you to cook any kind of grains with good taste without salt. Thanks in advanced. I rarely add salt or sugar to anything. When you break the craving for those items, you are free to taste the flavors of the food. Try spices and herbs to enhance flavors. Add garlic, onion, and mushrooms sauteed with a little oil or butter and then add broth or stock after you make sure they are not sticking to the pot. This combo is excellent with grains, beans or roasted vegetables. I have always been a healthy eater (compared to friends) and eaten salads of leafy greens and vegetables twice a day on a regular basis. But I was adding meat to my “lunch” salad in order to increase the protein. About 2 years ago, I decided I would only eat animal protein once/day and, instead of salad at lunch, I usually eat leftover roasted vegetables from the night before and add some beans/lentils or quinoa. More like you. Truly, the traditional American diet is pretty unhealthy. The rest of the world is so much less dependent on animal protein in their diet. My biggest difficulty arises from cooking for a husband who strongly prefers meat at each lunch and dinner – but he’s sure eating a lot more veggies then ever! I might suggest roasting a “sheet” of vegetables (squash, tomatoes, broccoli, carrots…) for use over a few days. I’m taking your idea of baking sweet potatoes ahead for the week. Thank you for the suggestion. I love to roast root vegetables to eat during the winter. Roasted parsnips are a particular delight. Thank you, Susie (who is over 70). Hi Susie. I rarely eat an evening meal or anything after 4 PM. If I do have dinner with Mr. Mickey, it will include pasta and mushrooms or wild caught fish or organic chicken breast with a vegetable. I would like some information on types of eyeglasses that should be worn by the face shapes (oval, round, square). Thanks. I love reading your blog. You give excellent information. By the way, I am 69. I have just recently found your blog and YouTube channel. I have been binge watching. I am 50 years old and have been overweight most of my life. After a serious health scare, at my doctors urging, i have changed my eating habits similar to yours. I am trying to get down to around 150 pounds….i have 50 pounds to go. I have a grocery list of all the ingredients to your breakfast porridge and am anxious to start eating it. Due to being overweight, I have never really enjoyed shopping or buying clothes for myself. After finding your channel i am starting to get excited about putting outfits together for myself. I am wondering if you have done a day in the life of video…I would find that interesting. Good for you Kelly! I was in your place about ten years ago. You can do this, and you will feel so much better. My days are never the same, but I am usually up by 5 (many times it’s 3). I move fast and often and eat two healthy meals each day and drink lots of water. Susan, have you ever tried making your own vegetable broth? It’s a simple and nutritious way to cut down on waste. Here’s what I do… https://edebock.wordpress.com/2018/02/18/garbage-soup/. Thank you for the tips. I am continuing to learn and add new healthy items to my diet. I rarely fly, but when I do, I take an apple, banana, and raw almonds. I buy a big bottle of water when I pass through security. Susan: I enjoyed reading “My Kitchen Tour.” Please let me know where you purchase the Kevita products. Thank you. I buy them from Fresh Market, Earth Fare and most other grocery stores including my favorite Health Food Store. Thanks for posting this I really enjoyed reading it this morning. Do you follow Dr. Fruman’s diet. Also do you do any exercise? I have read a couple of Dr. Fruman’s books, and I loosely follow a Nutritarian diet. 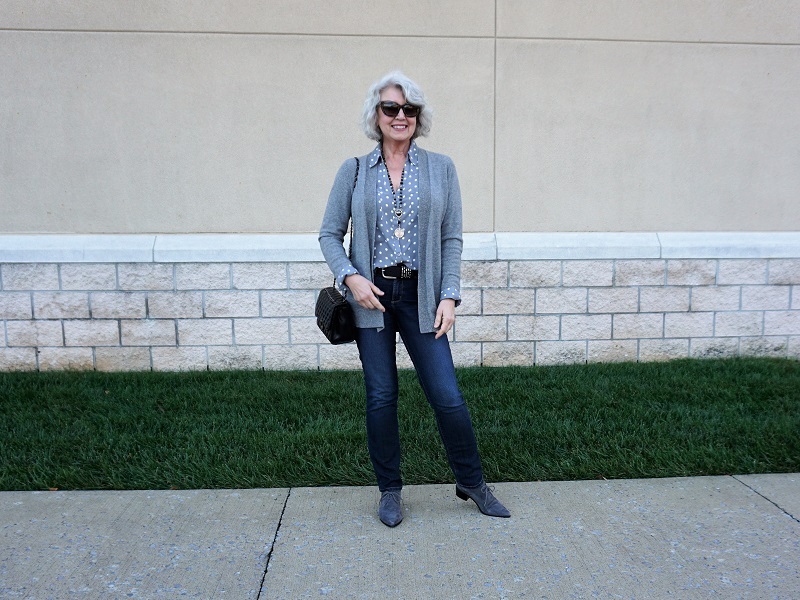 See today’s blog post (10-12-18) for the significant part my exercise routine. Do you have your humus recipe posted ? I apologize if you have already posted it before. Two cans of chickpeas, (Drain and reserve the liquid. Add it back as needed to get the consistency you like.) two cloves of garlic, the juice of two lemons, 1/2 cup of tahini (sesame seed butter), a couple of pinches of Kosher salt, 1/4 cup of Olive Oil, (paprika, more olive oil, and parsley to garnish). Blend in a food processor, blender or Vitamix. I could keep the hummus in the fridge for a week in an airtight container, but it never lasts that long. It is my favorite alternative to salad dressing. Thank you Susan. I will give it a try. Susan, Thank you so much for this post!! It helps me to SEE the items all neatly organized as you have done for us here. I LOVE your blog!! I’ve been following your post for about 3 years now and I am so inspired by your tips and hints. I have as many health issues as you had before your ‘reformation’. I’ve been trying to follow your health suggestions but haven’t succeeded as of yet. Still quite overweight and struggling with the many health issues. I’m 76 (soon to be 77). SEEING your kitchen supplies has helped me visualize what and how. I appreciate the healthfulness of your meals but I wonder how you keep from getting bored? Salads, soups and stews are really the same thing in different forms…no matter how great the variety of veggies, grains, legumes, etc..
Do you get variety from using different spices? Do you make Indian dal one day and ratatouille the next? Do you make lentil loaf or chick pea pasta primavera or black rice risotto or cauliflower gratin? I realize you’re not a professional chef but you get my point. I’m asking b/c while your tips and habits are inspiring, I’m not sure most people would last one week eating with such redundancy. Again, even with a great variety of ingredients your meals are decidedly spartan. Just wondering how you keep it fresh, new and interesting. Thanks! 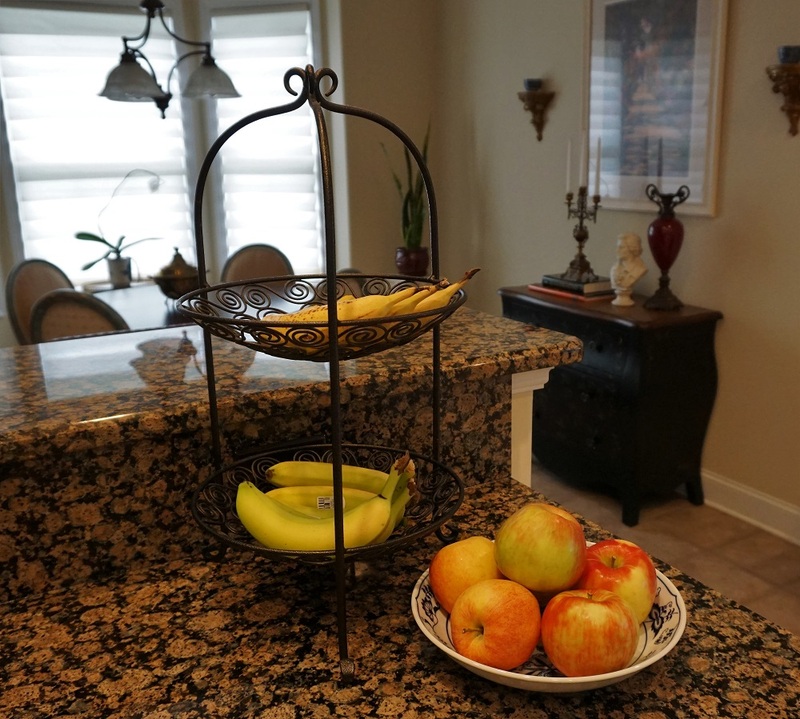 I look forward to having a variety of fresh fruits and vegetables while they are in season. I buy lots of types of grains, pasta or potatoes and have something different every day. We also eat out a couple of times each week, so I always try something I would never prepare at home. I am not a great cook, and I’m cooking for one, so there aren’t many elaborate dishes coming out of my kitchen. The key for me is to eat small meals that I prepare myself so that I know what goes into everything. I would enjoy knowing what your hummus recipe is! I’ve never made it before, but I love Chick Peas. Is it somewhere on your blog? I couldn’t find it! It is here in the comments. You can add other things such as roasted red peppers if you wish. Two cans of chickpeas, (drain and reserve the liquid to add a little back in if you want to thin the mixture) two cloves of garlic, the juice of two lemons, 1/2 cup of tahini (sesame seed butter), a couple of pinches of Kosher salt, 1/4 cup of Olive Oil, (paprika, more olive oil, and parsley to garnish). Blend in a food processor, blender or Vitamix. I could keep the hummus in the fridge for a week in an airtight container, but it never lasts that long. It is my favorite alternative to salad dressing. What an inspiration you are, thank you so much, I have just discovered you and will be faithful . Susan, that was a great post! 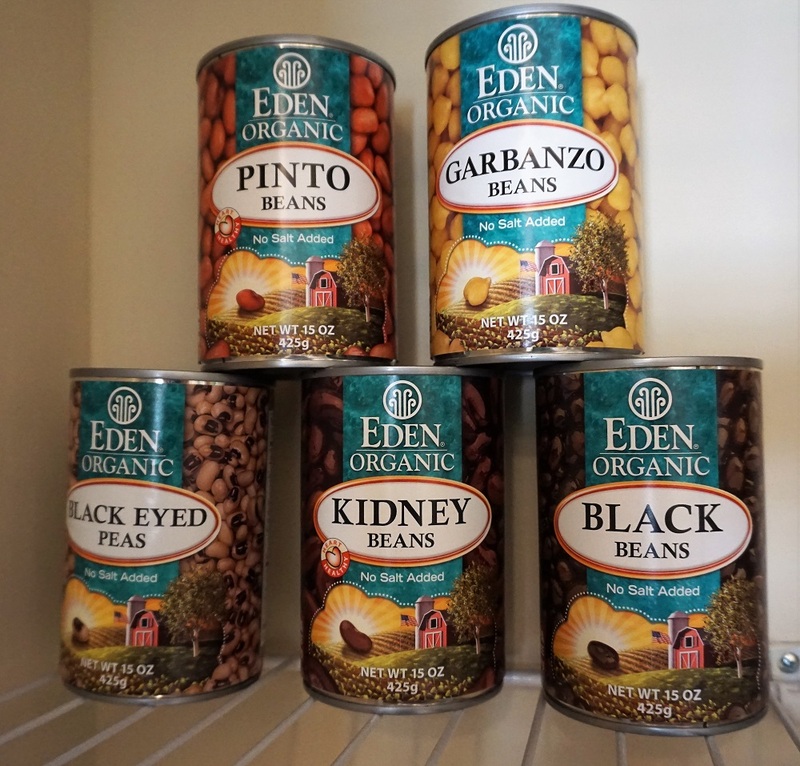 I really like the containers you use for your beans, grains, and nuts. Where did you find them & what are the sizes? Do you mean the ones in the refrigerator? There is a link in the description for the Glasslock containers. They come in different sizes. Scroll down to look at others on Wayfair here. They are Glasslock containers. What size Berkely did you buy? There’s only two of us ad I get confused on which size to buy. Thank you! I bought the Big Berkey for 1-4 people. I have to refill it about twice a week. Love your web site and your inspiration for living well after 60.